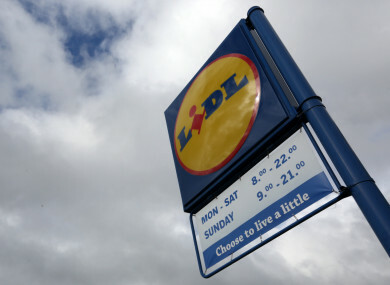 UPON RECEIVING PLANNING permission for a new supermarket in Galway, supermarket chain Lidl chose this as the moment to issue a strong statement attacking competitors for actions it described as “misusing the planning system”. Two observations were lodged on its application for the new Lidl store in Knocknacarra – one from Tesco Ireland and one from RGData, a representative association for retailers around the country that is aligned with Musgrave, the owner of SuperValu. The strong statement from Lidl said that these objections to its new Galway store was the latest in a “planned and sustained campaign to delay the construction and refurbishment of Lidl stores”. It went on: “The actions of Tesco Ireland and RGData serve their individual interests only; actions which are anti-competitive, anti-better value for consumers and anti-job creation. In lodging objections on spurious and, in many instances, on contradictory grounds both Tesco and RGData are misusing the planning system designed to cater for bona fide observations. For their part, Tesco and RGData have denied these claims from Lidl, and said they would never submit frivolous claims or misuse the planning system. Discount retailers Lidl and Aldi acted as something of a game-changer to the Irish supermarket industry when they entered the market at the beginning of this century. They have managed to make inroads to gain a sizeable share of the market. According to the latest data from Kantar Worldpanel, both German-founded retailers had an 11.7% share of the consumer spend in Irish supermarkets. Dunne Stores was in first place with 22.4%, following by SuperValu on 21.3% and Tesco on 21.3%. Supervalu has the most branches around the country, with 223 stores. Tesco has over 150 while Lidl has a similar number. Lidl is also plotting future expansion in the future and, over the past two years, has submitted a number of planning applications for new stores. When a planning application is submitted to the local council, third parties can make observations on the proposed development. If planning permission is then granted, and if a third party still wishes to object the development, they can launch an appeal with An Bord Pleanála. Planning documents show that, on dozens occasions since the beginning of 2015, rivals have made submissions objecting to the construction of a Lidl or Aldi in a particular area. Earlier this month, Lidl was granted permission from An Bord Pleanála for the construction of a new store in Bray, Co Wicklow, despite an objection from Tesco Ireland. In this case, Tesco said that the proposed development is “not consistent with the economic and employment zoning of the subject site as the primary use proposed is neither permitted in principle or open for consideration”. Tesco Ireland also objected to the demolition of an existing store and redevelopment in Edenderry, Co Offaly, which was also ultimately granted permission. Here, Tesco said the proposed design and siting weren’t in keeping with retail planning guidelines from 2012. RGDATA opposed a Lidl development in Mitchelstown Co Cork which was subsequently granted permission by An Bord Pleanála. Both parties were named as appellants to a proposed development in Ardee, Co Louth. While there is a Supervalu in that town, the nearest Tesco is more than 10 miles away. That development was refused permission in February 2017. In the past year, no case involving a Tesco or Supervalu store has been appealed to An Bord Pleanála by either Lidl or Aldi. In a large number of cases, the Lidl or Aldi gets the go-ahead anyway, albeit with a delay. When a process enters the An Bord Pleanála appeals system, there is a statutory time frame for which a decision must be reached. Until that decision is made, a development cannot go ahead. Figures released to Fianna Fáil’s Darragh O’Brien this week via a parliamentary question show that only 38% of cases up to the end of October reach a final decision within this statutory 18 weeks. In 2016, 79% of cases received a final decision within that period. In its statement this week, Lidl said it was supportive of an independent planning system with provides opportunities for “concerned parties” to make observations at all stages, it felt “it is appropriate to call out what is plain for all to see as vexatious delay tactics” by its rivals. For its part, Tesco and RGData vehemently denied the claims made by Lidl. A spokesperson for Tesco Ireland told TheJournal.ie: “Tesco Ireland only ever makes submissions on planning applications on a case-by-case basis and where there is a legitimate planning ground or precedent to justify it for example on matters in relation to zoning, retail policies or traffic concerns. Our aim is to ensure that the planning environment considers all retail developments on the same merits. And a spokesperson for RGData told us: “RGData is the representative association for independent family owned shops in Ireland. RGData supports the Government’s Retail Planning Guidelines which promote sustainable retail planning and vibrant towns and villages. RGData is involved in a major project with The Heritage Council to ensure the regeneration of Ireland’s Town Centres. RGData is not a vexatious objector. We base all our planning objections on sustainability and vibrant towns and villages. Email “An irate Lidl accuses rivals of 'planned and sustained campaign' to block it building new stores”. Feedback on “An irate Lidl accuses rivals of 'planned and sustained campaign' to block it building new stores”.